If you like the idea of always having access to fresh produce, can’t function without a regular dose of caffeine, and want to have a nice crisp brew in Beer City USA, then moving to Grand Rapids will be a perfect fit for you. Grand Rapids is the 2nd most populated city in Michigan and boasts an affordability that surpasses many larger cities like Phoenix and Chicago. 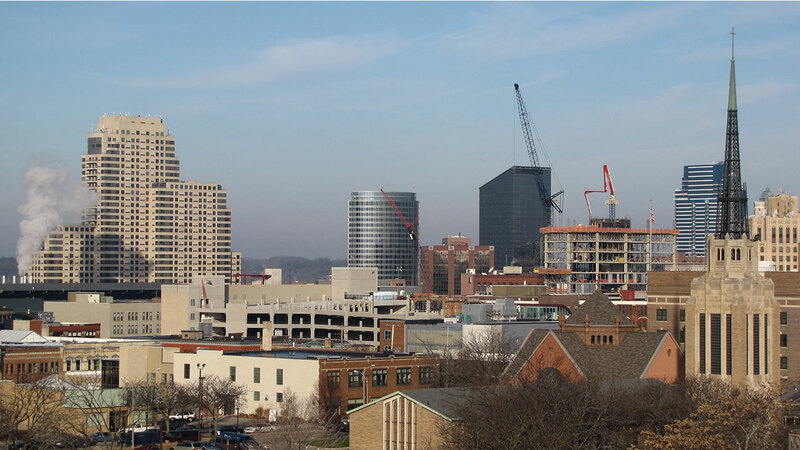 Being something of a college town, Grand Rapids especially appeals to young professionals and new families who are drawn to the city’s blend of big city amenities and action while still maintaining a suburban feel. Grand Rapids may not be in the top 100 largest cities in the US but there’s still a lot to know before moving here. To help, we’ve compiled a massive guide of useful links and information so you are as prepared as possible to move to Grand Rapids. 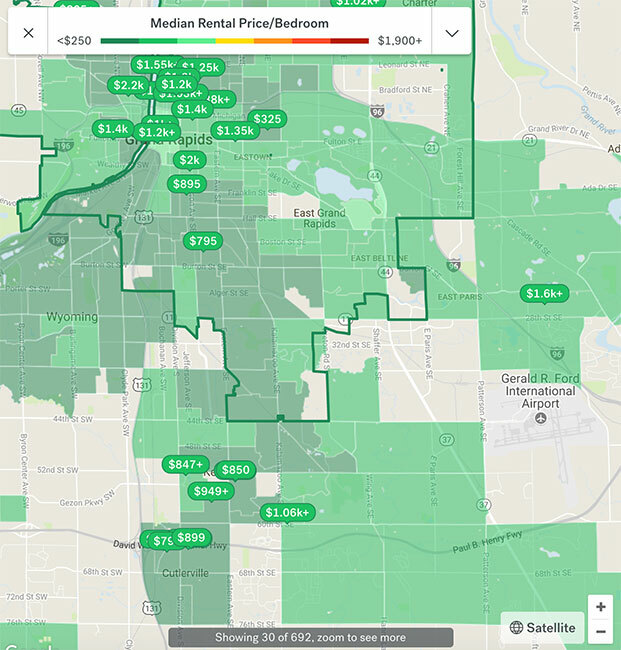 Which Grand Rapids neighborhoods are most affordable? Which neighborhood in Grand Rapids is the best fit for me? How long is the commute in Grand Rapids? How’s the walkability, bikeability, and public transportation in Grand Rapids? How dangerous is Grand Rapids? 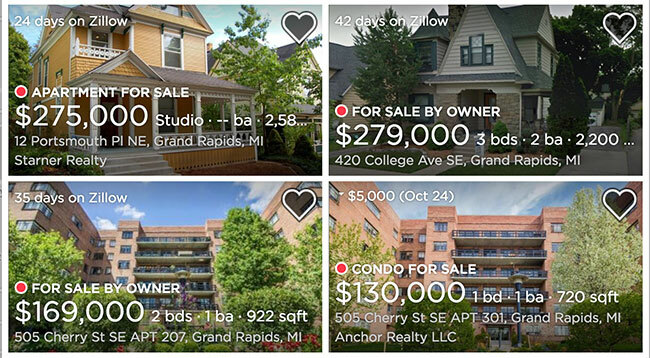 Where can I find apartments and houses in Grand Rapids? 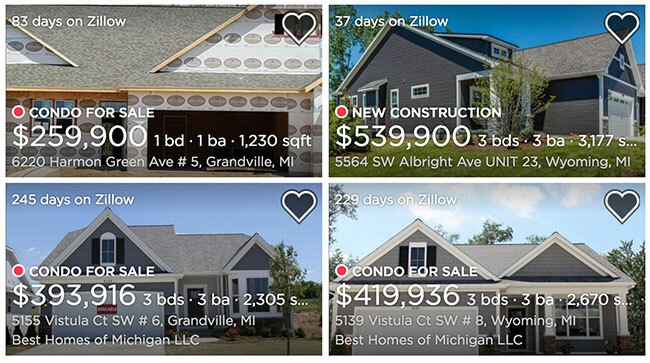 How much will it cost to move to Grand Rapids? What’s fun to do in Grand Rapids? And if you’re looking for more info on moving to Grand Rapids, check out our Grand Rapids move cost guide. As of 2018, Grand Rapids is the 122nd most populated city in the US with a population of 196,445. The average rent in Grand Rapids is somewhere around $804/month, making it the 65th most expensive average rent in the United States. And, in relation to other major cities, Grand Rapids is fairly affordable sitting as the 40th most expensive city in the US. Not bad for such an awesome city! As with every large city, Grand Rapids has a lot of neighborhoods. To help simplify things, it’s best to lump these neighborhoods into eight general regions: Downtown, Heartside, Heritage Hill, North Quarter, West Side, Uptown, Medical Mile, and Southtown. 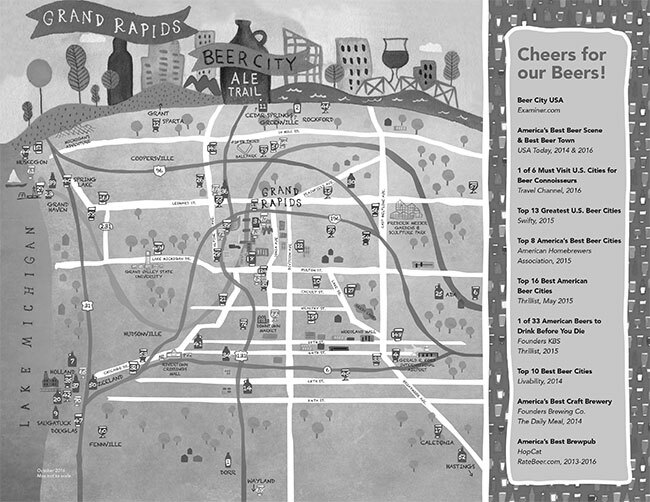 Each region of Grand Rapids comes with its own particular vibe and aesthetic. But before you get too concerned about finding the spot that best fits your personal style, you’ll need to make sure you can actually afford it. Judging by the Rental Hotspot Map from Trulia, you can see that the cost of rent varies pretty significantly depending on which part of the city you’re looking at. Like most cities, the centralized areas are more expensive and you’ll generally find that rentals tend to be more affordable the further from the center of the city you get. If you’re looking for a place that’s on the more affordable side, you’ll want to check out areas like Highland Park, Ridgemoor, and West Grand where you’ll find average rent between $750 and $850. You’ll find places like Creston, Heritage Hill, Michigan Oaks, and Swan to be more in the mid-range, with $915 to $1,030 average monthly rents. And if you don’t mind paying anywhere from $1,100 to $1,360 then you should look at Heartside, Belknap Lookout, Midtown which all fit within the category of higher priced rentals. But before you go signing a lease, let’s make sure you’ll like your neighbors. Where are people like me living in Grand Rapids? 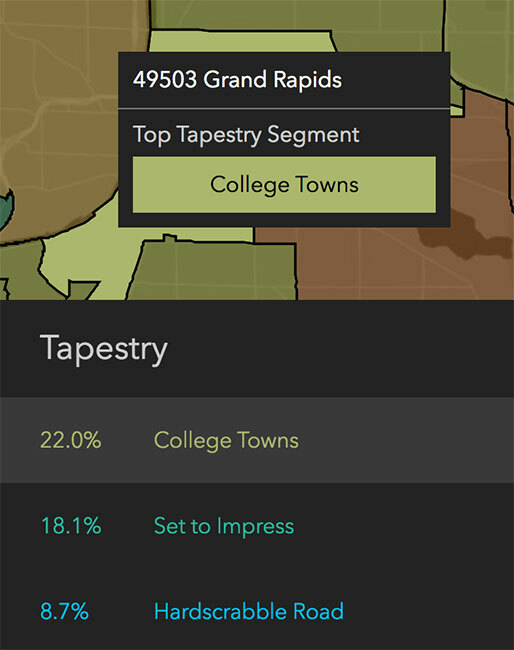 Zip Tapestry tool at Esri.com gives you’ll all the data you need to see the types of people that make up different neighborhoods. Just type in a zip code (for this example we used 49503) and they’ll show you data on every demographic subsect in that region including the three largest sections of the population. Beyond liking where you live, you’ll also want to make sure you’re able to get to work from your home. As far as cities go, commuting in Grand Rapids is surprisingly not that bad. Overall, the majority of commuters in Grand Rapids choose to drive. In fact, over 90% of residents drive as their primary means of transportation. Despite the reliance on cars, GeoStat data above shows that Grand Rapids has fairly short commute times of 15 – 19 minutes which fall below the national average. 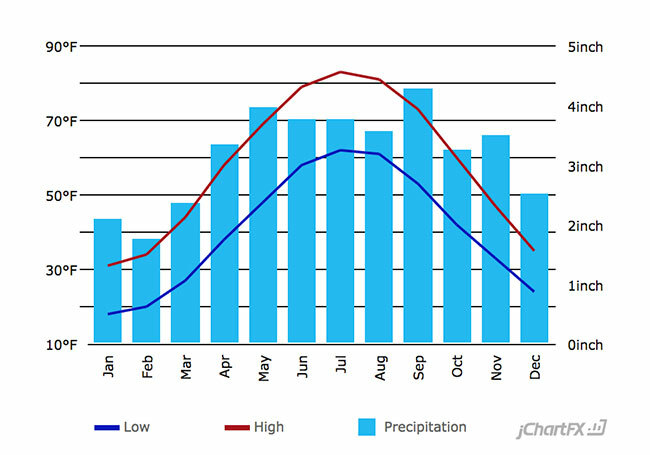 One reason Grand Rapids is car-dependent is the cold weather and snow. But that doesn’t mean there aren’t other great commuting options for non-drivers. 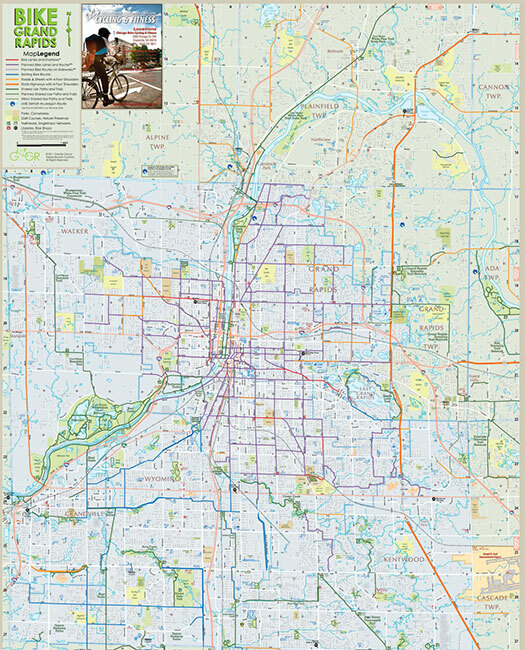 Grand Rapids is decently accessible for both pedestrians and cyclists as well as having adequate (if limited) public transportation. A walkscore of 55 is actually pretty great compared to most cities. The downtown areas, in particular, are great for walking, especially after the city’s implementation of a new pedestrian safety campaign. 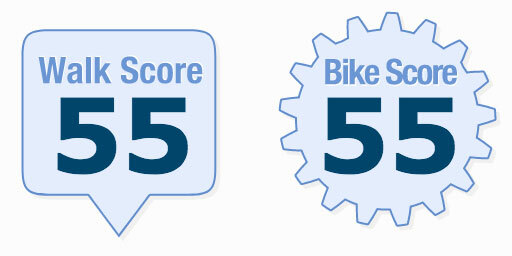 There are a good number of bicycle enthusiasts in Grand Rapids, as evidenced by its 55 bike score. Overall, there are a fairly large number of people cycling regularly in Grand Rapids which has caused the city’s bicycle industry to grow to a point where it’s well supported. In fact, the Greater Grand Rapids Bicycle Coalition has made it a goal to provide resources for cyclists as well as organizing Active Commute Week to encourage more forms of alternative transportation. And while the winter may put a wrench in things. Some people have figured out how to pedal through the cold. Public transportation in Grand Rapids is decent but has a fairly limited reach. 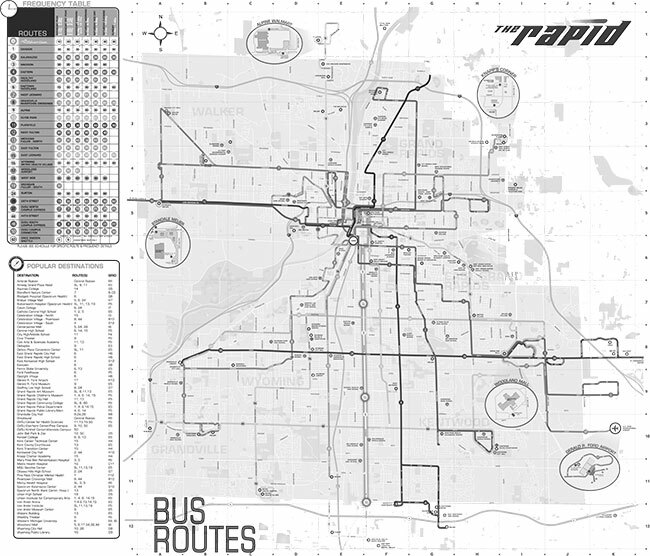 Bus transportation is handled by The Rapid which runs frequently and consistently throughout downtown and the connecting suburbs. But if you need to go much further, you’re probably out of luck. Fortunately, Grand Rapids has a Greyhound station that’ll help if you need to travel outside of town. That about covers how to get around. But is Grand Rapids a safe place to live? No matter where you’re moving, you should probably get a sense of its crime rate beforehand. NeighborhoodScout sets Grand Rapids’ crime score at 18 out of 100 (with 100 being the safest possible score). While that may seem sort of low, it’s actually pretty fantastic for a city this size. Looking closer at the details, you’ll see that violent crime accounts for 30% of total crime in Grand Rapids, which isn’t great, but that statistic is skewed a bit due to the fact that overall crime in Grand Rapids is low. Alright, now let’s actually figure out where you’ll be living. When apartment hunting, your first focus should be finding one with the amenities you’ll need. So yeah, Grand Rapids is pretty squarely in the Midwest, which means you’ll be experiencing both the highs and lows of every season. Obviously, the winters get cold and the middle summer months are muggy and hot. It’s safe to say you’ll need a place with both heat and air conditioning. Keep this in mind when you’re calculating the average cost of utilities per month so that you can adequately budget for an apartment. Finding a good source for apartment searching can be really difficult, which is why we’ve compiled a list of some of our go-to’s when it comes to finding housing in Grand Rapids. 2018 renters in Grand Rapids can look forward to a market that started the year “hot” and has remained stable ever since. Recent changes in Grand Rapids rent have seen a 4.78% decrease while the vacancy rate has increased by 0.7% which is small, but not insignificant. So yeah, the market is doing pretty well but even with those signs of improvement, affordability is still an issue. No matter what state the rental market is in, it’s a good idea to know your rights as a tenant to make sure you don’t get taken advantage of by a sketchy landlord. And if you don’t want to deal with the hassle of renting, Grand Rapids has plenty of options for buying a home. If you aren’t big on city life, don’t worry! Grand Rapids has tons of great nearby suburbs which are well within commuting distance. In late 2017, the median home value in Grand Rapids was sitting at $135,100 which was a 10.6% increase from the previous year and projected to increase 5.2% in the following six months. Heritage Hill is a quaint, historic neighborhood that’s a great alternative to living directly downtown. It’s low rent and historic homes are particularly appealing to college graduates and young families. The town of Grandville is a popular option for those who want to live outside of the city but wish to have a short commute. The area’s quiet, suburban feel and easy access to public transportation make it very popular with young families and young professionals alike. Use our moving cost calculator to estimate your moving costs to Grand Rapids. And depending on where exactly your home is, you might need to get special permission from the city to park a moving truck near it. Grand Rapids Parking Services should tell you whether you need a permit and how to get one. Congratulations, you’ve moved to Grand Rapids! Now all that’s left to do is taking care of a few logistical items before you can kick your feet up and relax. Register To Vote: You’ll want to register to vote in Grand Rapids ASAP to make sure you have a say in what happens in your new community. Driver’s License: Be sure to prioritize updating your driver’s license too, since you never know when you’ll need ID with your current address on it. out of State Vehicle Registration: If you’re bringin’ a car with you, it’d be a good idea to get a Michigan license plate sooner rather than later as well. Trash & Recycling: Definitely prioritize setting up an account with Grand Rapids Recycling and Refuse so that your garbage actually gets collected. Make Friends and Meet New People: What was once the most difficult part of moving has been made much simpler by the internet. Head tor/grandrapids to learn about what’s happening around town and sites such as Meetup for linking up with people who share your interests. Once you’re settled, you’ll probably want to relax and enjoy your free time. When exploring a new city, the best first stop for things to do is its tourism website which will let you know what makes Grand Rapids unique. Fans of craft brews will be pleased to learn that Grand Rapids is considered one of the best beer cities in the US, boasting over 70 breweries and distilleries. And for the more outdoorsy types, Grand Rapids has plenty of parks and outdoor activities for hiking, picnics, and other family activities to keep busy and active during the warmer months of the year.